I’ve been getting pretty into cognitive science lately. I realize some of it is useless, and a lot of the rest of it is made up of kind of common sense things once you really think about it, but regardless, I have found it so helpful to put scientific names and research to intuitions I have in the classroom. One of the ideas that I have really liked (from Daniel T Willingham’s Why Don’t Students Like School?) is that we learn everything by connecting it to things we already know, and much of what we already know is concrete. Thus, the more you can teach through concrete examples, the more likely students are to learn the material. What was a speed that you are 100% sure that you must have gone in the time in between? Why? What was a speed that you could have gone in the time between, but you aren’t 100% sure? Why? What was a price that you are 100% sure that the iPhone must have had in the time in between? Why? 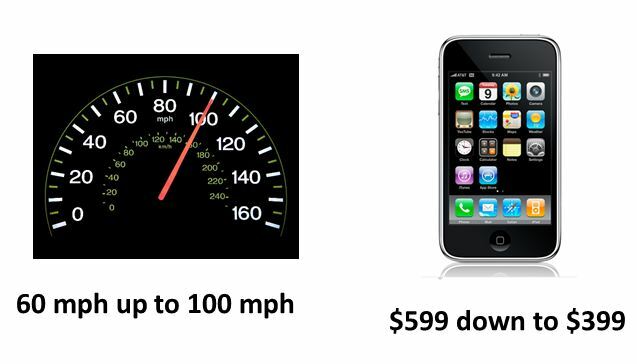 What was a price that the iPhone might have had in the time between, but you aren’t 100% sure? Why? 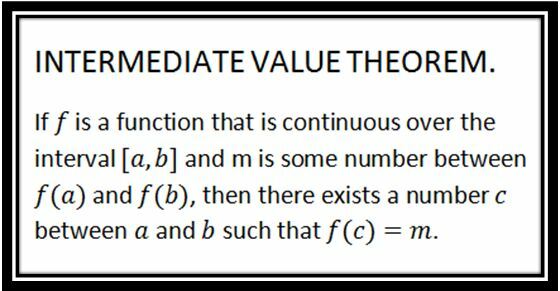 Prepped with the ideas of theorem, we took the speed situation and translated it into a mathematical theorem before looking at the actual Intermediate Value Theorem. It took about 10-15 minutes of class, which was well worth having a strong conceptual understanding of the theorem. Students still struggled mightily with proving anything with the theorem (as they have in proving anything mathematically both this year and in previous years – any advice there?) but the conceptual development of the idea was not only quicker, but I think stickier. Isn’t that better than starting with this?